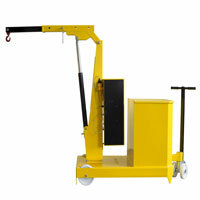 GzB 10700 is a heavy-duty counterbalanced workshop crane (built-in ballast weights) suitable for lifting loads up to 700 kg, with a 4-position extendable jib. It is fitted with a handy pendant control station to activate lifting and lowering of the jib, completed with an emergency button. An optional jib extension increases the crane reach up to 2000 mm (at 150 kg capacity). It is equipped with two fixed wheels and two revolving steering wheels in order to make it easy to maneuver even in full load condition.